Sorry to regular readers for my long absence. I've been getting into the groove of daily postings for b5 media on Common Sense PR, and have been neglecting my duty to inform and entertain you. For a quick view of what I've been up to on the other blog, check out the Top 10 Posts for the past three months. I've missed my more relaxed writing on this blog, and am hoping to post here several times a week for the foreseeable future. Anyone who wants a refund of the subscription fees, please send me an e-mail to arrange payment. A while back I announced that I'd be making some blog changes. The day has arrived. Drop by Common Sense PR and let me know what you think. At the time I decided to launch a new blog, Jeremy Wright announced that blogging network b5 Media was looking for writers for a planned business channel. I sent b5's Douglas Hanna a proposal. The next thing I knew I was writing posts for the blog-to-be. I'll be writing primarily for business managers and communicators. I've found that quite often managers don't know how to get the most out of public relations, and communicators don't know how to get buy-in to communications plans. Yes, there will be ads. Yes, they will sometimes get in the way of the paragraph you are trying to read and they may do annoying things to attract your attention. I'll try to keep the writing and visuals exciting enough to get you past the distractions. Thanks to ad revenue, I may be able to get to some more conferences and events in the future. For people who subscribe to feeds, the blog will have a full text feed available, so you don't have to leave the comfort of your feed reader. Please drop by, subscribe, and let me know what you like and don't like. 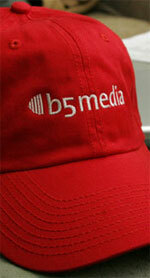 Check out some of the other business blogs on b5. I'm pretty excited about the possibilities for creating an information nexus for the business reader. Thanks to my editor Douglas, the designer Scott, CEO Jeremy, and all the bloggers at b5 who have made me welcome. It's been hard keeping this under wraps until launch day (everyone I told about this -- don't tell Jeremy I was a bad boy). Update: I realized I didn't mention anything about Mutually Inclusive PR. This blog will continue, with a bit less emphasis on public relations/communications. I'll be migrating the content to a new server soon at www.ericeggertson.com, but will keep posts active on this Typad server for a while, to keep the links from breaking. Antonia Zerbisias doesn't post to her popular blog about media, politics and culture for two months. She drops in on Halloween, posts 17 words, and gets 157 comments. Those are dedicated readers. When the large public relations firm Edelman went into a protective silence instead of engaging its critics over a pro-Wal-Mart blog, it reminded me of HAL, the computer in 2001, A Space Odyssey. HAL was just doing his job. But we learn in the next movie (or book, for Arthur C. Clarke fans) that HAL's psychotic behaviour was a natural reaction to being given two contradictory orders by its programmers. Edelman has repeatedly stated it wants to uphold transparency and honesty in its word-of-mouth marketing and social media activities - both for itself and on behalf of clients. Compare that to the military, man-the-barricades mentality that is ingrained in the corporate culture at Wal-Mart. Add a prevailing attitude in U.S. politics/marketing/culture that if you just repeat a lie long enough, the public will accept the lie as truth. It's a very typical situation where the client doesn't want to operate in the real world because the rules of behaviour are inconvenient. The public relations agency's job is to educate the client and show them how they can gain from behaving in a less anti-social manner. There are many, many compromises to be made on both sides before that kind of transformation can take place (if that's even possible). The blog was one of those compromises, and president Richard Edelman has acknowledged "the cross-country tour that Edelman designed" was done in a way that violated the agency's stated principles. His apology was a good step toward clearing the air. I attribute the fact that it took him several days to respond to the criticism of bloggers to the HAL syndrome. It's hard to respond to complaints about your actions when you're just doing what the client wants. See Shel Holtz's Edelman and the One-sided Conversation, and a few dozen other posts - IR Daily, twopointouch, Open (finds, minds …, hyku | blog, JD on EP, Marketing Begins At Home, Joe Duck, PR Squared, Scobleizer, The Post Money Value, Blog Business Summit, Message, Publishing 2.0 and A View from the Isle (links via Techmeme). Update: Edelman's internal investigation has turned up two more fake blogs. Surprise, surprise - both related to Wal-Mart. That just reinforces my impression that the client is driving this particular wagon. You stay subscribed to some blogs just because you like to be surprised by whatever the person might do. I came across Gillian Gunson on Flickr, and have subscribed to her blog Gillianic Tendencies for a year now. Lots of discussion of her cat, her job, her hair. Lots of self-portraits and angst about her cat, her job, her hair. And a bright personality that shines through it all, keeping me coming back.